J. C. R. Licklider is known for his contributions to the advancement of computer science. He is often referred to as the father of the Internet, and the Johnny Appleseed of computing. Licklider was a revolutionary visionary for the symbiotic relationship between humans and computers. Licklider envisioned time-sharing automated computers, computers assisting in decision making, and a network of computers to easily transfer and retrieve information. This vision ultimately led to the creation of ARPANET, which eventually evolved to the Internet we know today (Living Internet, 1996-2010). Licklider preferred to be called Lick. He was born in 1915 in St. Louis, Missouri. In 1937 he obtained three bachelor degrees from Washington University in the fields of physics, mathematics and psychology, a unique combination for his time. A year later, 1938, he received his M.A. in psychology, and continued his education at the University of Rochester to receive his Ph.D. in psychoacoustics in 1942. Afterwards he became a lecturer at Harvard from 1943-1950. While at Harvard Licklider spent most of his time researching, but he also taught statistics and physiological psychology. In an interview, Licklider said that he was really enjoying his time at Harvard, but "there came a time that I thought I had better go pay attention to my career." (Licklider, 1988) It was then that Licklider left Harvard for a position at MIT. During his time at MIT as an associate professor he continued his psychoacoustics research and published an article titled "A duplex theory of pitch perception". Licklider fulfilled his original hiring objective, and established a psychology department with the intention to educate engineering students the importance of designing with the user in mind. In today's parlance this has evolved into its own field of study called human-computer interaction. Licklider participated in two summer studies at MIT. The second, Project Charles, led to the creation of the Lincoln Laboratory that produced the Semi-Automatic Ground Environment (SAGE) system design. The SAGE program was "established in 1954 by the US Air Force to develop a continental air defense system to protect against a nuclear bomber attack from the Soviet Union." (Living Internet, 1996-2010) The experience from working on this project, with engineers, psychologists, radar machines and computers had a lasting effect on Licklider. Around this time, Licklider made his first strides in his scientific career. Licklider increasingly became interested in computing, and with his educational background he had a unique viewpoint. Even though the SAGE project consisted of state-of-the-art technology Licklider saw how computers could do more than just collect and present data. In 1959 he published his first book, Libraries of the Future. He used Vannevar Bush's idea of an automated library system and expanded it to describe how computers could be used to make library resources available to multiple remote users through a single database. In 1960 Licklider published his most famous paper Man-Computer Symbiosis, where "he described a computer assistant that could answer questions, perform simulation modeling, graphically display results, and extrapolate solutions for new situations from past experience" (Living Internet, 1996-2010). In 1962 Licklider became the director of the Information Processing Techniques Office (IPTO), at ARPA, the United States Department of Defense Advanced Research Projects Agency (DARPA), where he over saw the behavioral sciences command and control research area. During that same year Licklider sent a memo to his colleagues outlining the challenges of creating a time-sharing network of computers. Ultimately this vision led to ARPANET, the forerunner of today's Internet (Licklider, 1963). Licklider's innovative contributions to the computer science field of his time had profound impacts on the future advancements of computers, networks, and the Internet. 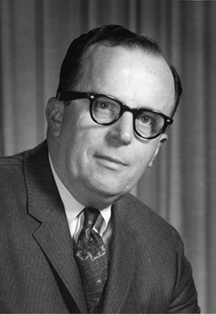 Licklider died on June 26, 1990 from a heart attack after complications from an asthma attack. He was seventy-five years old. He lived to see the basis of the internet and many of his theories put into practice. JCR Licklider was visionary for human-computer interaction and strived for a better way of computing. This page was created by Raychel Rappold for Project 1 of the Intro. to Multimedia course offered at RIT. The main page for this class is located here.